My students LOVE solving PUZZLES!! Logic puzzles test students’ critical thinking in a fun way. They challenge students to read, organize and analyze information to solve an interesting problem. The answers to logic puzzle questions never explicitly appear in the clues; they must be inferred. Solving logic puzzles helps develop critical thinking skills important in all subjects and helps students learn to rely upon their own ability to reason. Students who can solve logic problems have greater confidence in being able to tackle problems to which the answers are not immediately evident. Logic puzzles can be suitable for young children as soon as they are able to read the clues. By including more variables, puzzles can be challenging for older or more experienced solvers. I often provide puzzles at several levels of difficulty for my students to complete. They can choose on their own which puzzle is right for their abilities. Sometimes the puzzles are related to the academic information we’re working on in class, but often not. The puzzles are their own lesson – training for the students’ brains. Try it out for yourself! 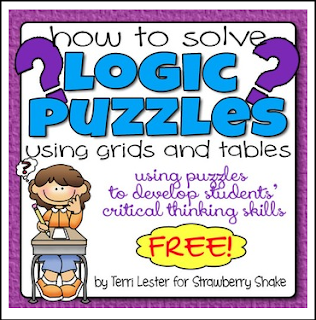 This guide will teach you how to solve logic puzzles using the grid method. One beginner level puzzle is provided for you to practice. FOLLOW my store to be the first to know about NEW logic puzzles and other fun, challenging brain stretching activities! © 2014 Terri Lester for Strawberry Shake. All rights reserved. Purchase of this unit entitles the purchaser the right to reproduce the pages in limited quantities for classroom use only. Duplication for an entire school, an entire school system or commercial purposes is strictly forbidden without written permission from the publisher.